Open your garden to a wealth of birds with this Heartwood Wild Bird Bistro Bird Feeder with Verdigris Roof. The hardy materials, classic color scheme, and traditional shape welcome your feathered friends to dine in your garden. White, cellular PVC forms the feeder body and bottom platform, and plastic panels create the reservoir. This chamber easily holds 3 quarts of mixed seed or peanut chunks, and gaps at the base of each plastic panel allow it to exit onto the tray for easy dining. The feeder body also tapers toward the base, directing seed toward the gaps, and bringing striking shape to your setting. Crescent cut outs on each corner of the base are sure to capture attention, and drainage holes here ensure seed remains dry. The significant, verdigris roof further protects feed, and may be removed from the body for refilling or thorough cleaning. Use the included mounting bracket to display this piece on a 4 x 4 post. The cellular PVC body will not rot, peel, warp, for a sturdy and beautiful item for many seasons. The verdigris color of the copper roof adds a timeless hint to the piece, turning a corner of your yard into a wonderful bird haven. 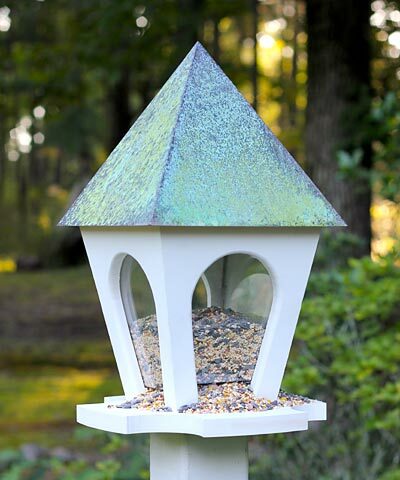 Keep several birds fed using this Wild Bird Bistro Bird Feeder with Verdigris Roof. Made in the USA.